The nature of global risks is constantly changing. Thirty years ago, chlorofluoro-carbons (CFCs) were seen as a planetary risk, while threat from a massive cyber attack was treated by many as science fiction. In the same period, the proliferation of nuclear weapons occupied the minds of scientists and politicians, while the proliferation of orbital debris did not. We see a similar story with asbestos then and carbon nanotubes today, and the list goes on. With new information, the perceptions and realities of risks change, and often in unforeseen directions. Consider that in some circles the threat from greenhouse gas emissions made nuclear energy seem less hazardous than fossil fuels over the long run. Yet the nuclear catastrophe in Fukushima not only changed public perceptions in Japan but also energy policy, almost overnight, in some parts of Europe. The World Economic Forum is now in its eighth year of publishing the Global Risks report. The purpose of the current edition is twofold. First, it aims to show how experts from around the world, from different backgrounds, currently perceive the risks that the world is likely to face over the next decade. To capture these opinions, a survey was carried out, interviews were conducted with specialists in different fields, and a series of workshops and conference sessions were held with expert groups to interpret the research findings and to work out the three risk cases developed in the report. Second, with this report the World Economic Forum aims to continue to raise awareness about global risks, to stimulate thinking about how risks can be factored into strategy development, and to challenge global leaders to improve how they approach global risks. The Global Risks Perception Survey was conducted in September 2012. 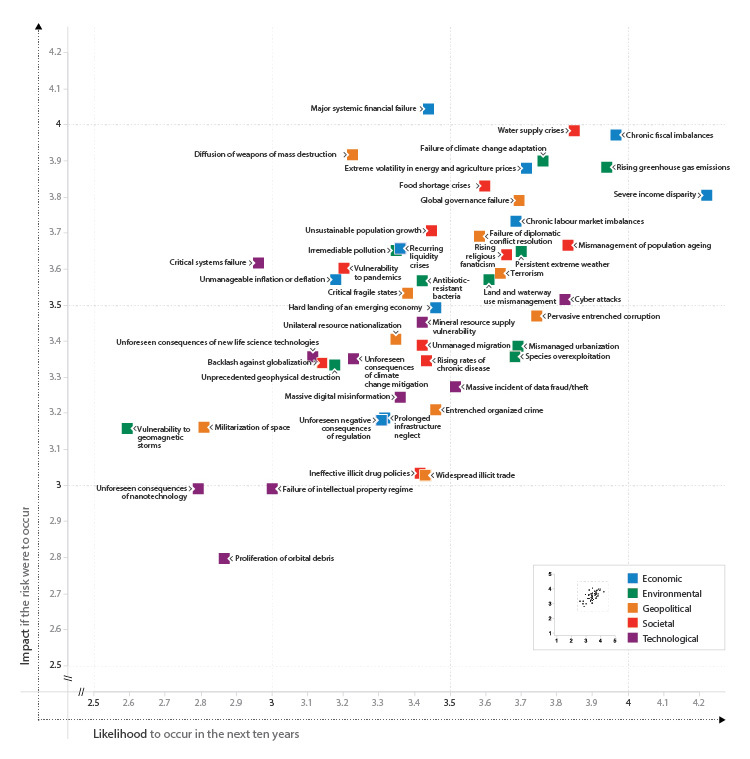 More than 1,000 experts responded to evaluate 50 global risks from five categories – economic, environmental, geopolitical, societal and technological. For each global risk, survey respondents were asked, “On a scale from 1 to 5, how likely is this risk to occur over the next 10 years?” and “If it were to occur, how big would you rate the impact of this risk?” The aggregated responses to these two questions are depicted in the Global Risks Landscape scatterplot in Figure 2. The evaluation of the 50 risks also focused on their linkages, given their interdependent nature. Survey respondents were asked to nominate pairs of risks that they believe to be strongly connected. They were also asked to nominate a “Centre of Gravity” – the systemically most important risk for each of the five categories of global risks. Putting all paired connections together results in a network diagram presented in Figure 37 in Section 4 – Survey Findings. The survey data was also analyzed to examine how the background of the respondents affects their perceptions. Are the views of people based in Europe similar to those in Asia? Do younger people perceive the world differently from older people? And how does specialist knowledge in a field affect how risks are perceived? These questions are explored in Section 4 of this report. The 50 global risks in this report are interdependent and correlated with each other. The permutations of two, three, four or more risks are too many for the human mind to comprehend. Therefore, an analysis of the network of connections has been undertaken to highlight some interesting constellations of global risks seen in Figure 3. 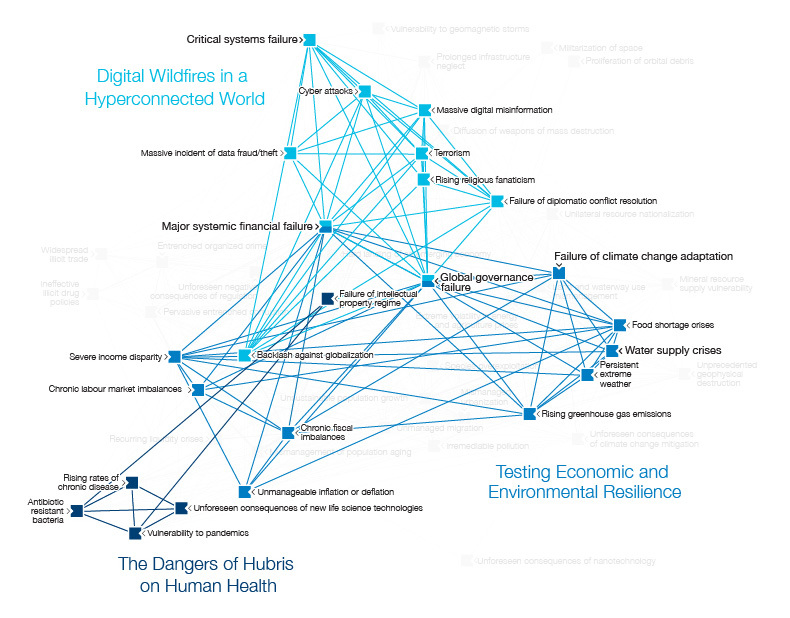 In Section 2, these constellations of global risks are presented as three important cases for leaders: “Testing Economic and Environmental Resilience” on the challenges of responding to climate change, “Digital Wildfires in a Hyperconnected World” on misinformation spreading via the Internet, and “The Dangers of Hubris on Human Health” on the existential threat posed by antibiotic-resistant bacteria. The section on X Factors invites the reader to consider emerging concerns that are not yet on the radar of decision-makers. If the 50 global risks represent “known knowns”, then these X factors could be considered as “known unknowns”. They were co-developed with the editors of Nature and benefit from their contributors’ deep knowledge of cutting-edge scientific research that has not yet crossed over into mainstream discourse. *See Figure 37 in Survey Findings for the complete global risks interconnection map.